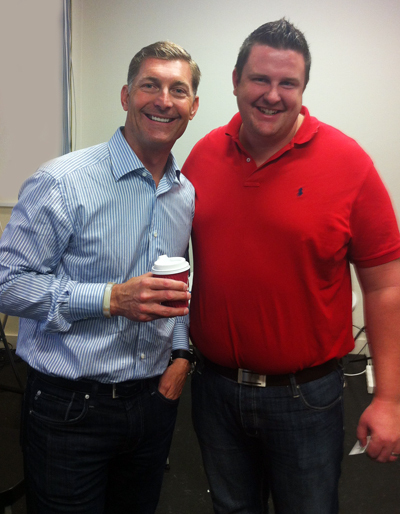 I had the privilege of meeting Gary Swart from oDesk this week. He had come with his team to visit Australia; he said their business is booming here in Australia with over 35,000 customers. His talk was made at the Sydney Tech Meetup held at Fishburner’s in Sydney; his talk gave a great insight into the new way of recruiting talent. Many businesses in Australia are seeking contractors online. We as Australians have always been early adopters of disruptive changes and it seems that hiring outsourced contract staff off the internet is no different. Gary gave a great brief history of how oDesk started, he said that the founder of oDesk was working for a software company in the US and he wanted to hire a lifelong friend he had in Athens, Greece. He went to his boss at the time and asked if he could hire him for the role they had available. To which his boss replied “How can we hire him, he is in Greece? How will we know he is working?” computer engineer Odysseas Tsatalos and founder of oDesk created a program that allowed him to share screens with his high school friend in Greece. This enabled his boss to monitor the work being produced by Stratis Karamanlakis (aka oDesk cofounder). The program was enhanced with additional features such as screen capture and tracking. Odysseas and Stratis knew this may have broader appeal so they started oDesk and the rest is history. oDesk is now the largest online workplace for talent in the world. Companies in Australia are embracing this new virtual office; it is a great way of saving costs and helps you gain an edge on your competition. You can have a lot more tasks completed with this increased workforce. “By 2020, we think one in three people in North America will be working online,” said Gary Swart, chief executive officer of oDesk,The Redwood City, Calif.-based service has more than 3 million contractors and 540,000 customers worldwide. More than 35,000 customers in Australia use oDesk. Gary answered several questions from the crowd and shared examples from Opentable, AirBNB and Dropbox. Some of the tasks people use oDesk for include, Bookkeeping, Online Research, Managing their client databases and social media management. However when oDesk first started the main focus was for programmers, People needed expert programmers but only for short timeframes. Projects would come up and might require a contractor for a few weeks. This is where oDesk would step in and suggest contractors from all over the world to get the job done. The main thing people need to work out is what parts of their business would be suitable for outsourcing. There might be point where if you start outsourcing too much work, you can have it negatively affect your business. By not having enough qualified staff based locally. However there are some start-up businesses right now that are using all remote workers and these businesses are seeing great results. If you get the right balance you may gain a competitive advantage over other businesses that are slow to adopt this new way of sourcing talent. I can see a lot of benefits to employees, no long bus or train rides from outer suburbs of Sydney. You can work from home so no more after school expenses and you can work for longer because you save hours travelling to and from work. So whether you are looking to hire some gun programmers or you are looking to pick up some extra work on the side. You might want to have a look at oDesk! Let us know your thoughts on accessing global talent pools, have you used oDesk before or a similar company? Let us know in the comments below.